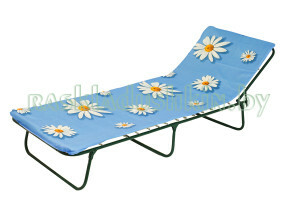 Classic folding bed intended for the adults and for the children as well. It is given traditional construction and presented as metallic frame fixed at three metallic supports. Synthetic woven material is used as the baseboard. It is fixed at the bed’s frame by means of zinc-coated springs and is simultaneously used as the mattress with soft pad made of polyurethane foam sheet of 10 mm thickness. Metallic frames are made of firm steel pipes of 18 mm diameter and 1 mm thickness.